romesick (adj.) - to feel nostalgia for the Eternal City. Every so often a strong feeling of longing for Rome comes over me. I miss all of its chaos, history and beauty. I miss that intoxicating smell of fresh baked goods, car exhaust and espresso. I miss the blue sky that has no equal anywhere else in the world. And of course, I miss the food. Oh how I long for my local bar in Rome. Every morning I would trot down the stairs of my apartment building, take a left, another immediate left and make my way up to the Corso Vittorio Emanuele. The cafe that occupied the corner was my destination. The barman would see me coming up the street and would start the makings of a cappuccino, then would reach into the pastry case and grab a maritozzo, handing it to me at the exact moment that I sidled up to the bar. The rhythm of life. Tradition. Habit. I loved it. A maritozzo is a delicious, yeasty roll. Airy and not too sweet, it goes perfectly with a cappuccino. I am a purist so I take my maritozzo plain, but the more traditional way to eat it is stuffed with whipped cream. Restraint really does get thrown to the wind when it comes to dining in Rome. Of course you can get a yogurt with fruit for breakfast, but why would you when you can have a sweet bun stuffed with whipped cream? I was thrilled to see that Katie Parla included a recipe for maritozzi in her book Tasting Rome. My first attempt was not the best. I think the milk was too warm when I added the yeast to it and the buns never rose as much as I would have liked. The second attempt was better but somehow, here in the States, a bun overflowing with whipped cream seems inappropriate for breakfast (damn Puritans). So I improvised and combined a Roman tradition with one of the most quintessential American desserts (after the apple pie). And thus was born the Strawberry Shortcake, Italian Style. 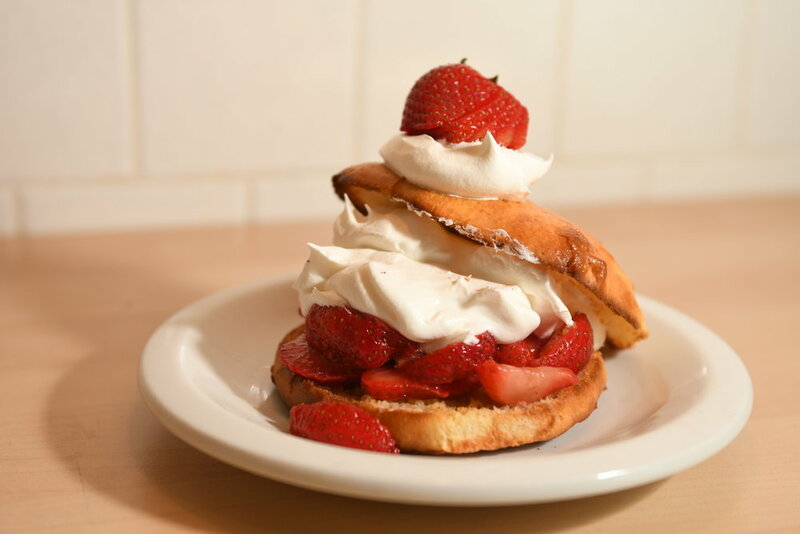 I used the maritozzi in place of the shortcake and went for a very lightly sweetened whipped cream (1 T of powdered sugar for 2 cups of whipping cream). Despite the fact that the size of the maritozzi made for an enormous serving size, the plates all came back to the kitchen empty. The kids actually ate theirs like a panino. It wasn’t pretty but the consensus was that it was delicious. Many recipes for these sweet rolls include raisins and candied fruit, but I think the plain ones are the best and the ones you most often find in cafes in Rome. The maritozzi will inarguably take longer to make than your traditional shortcake (there is 2 hours of rising time involved), but I dare say, the commitment is worth it. I encourage you to try baking them - the process is therapeutic and the results are so satisfying. Make the Sponge: In a medium bowl, whisk the yeast into the milk, then add the flour and sugar and stir to combine. Cover the mixture with plastic wrap and set aside until puffy, about 20 minutes. Make the dough: In the bowl of a stand mixer fitted with the paddle attachment, combine the butter, sugar, salt and eggs on low speed. Switch to the dough hook. Add the sponge, mix for a few turns, then add half of the flour. Mix on low until the dough is smooth, about 5 minutes. Add the remaining flour and mix again on low until the dough is smooth, about 2 minutes, scraping down the sides of the bowl as necessary. Allow the dough to rest in the bowl for 10 minutes, then run the mixer on low for 10 minutes to stretch the gluten. Meanwhile, line two rimmed baking sheets with parchment paper. Turn the dough out onto a lightly floured surface and divide it into twelve equal-sized pieces (each about 2 1/2 ounces) Using one hand, roll each piece into a tight ball, pressing it against the counter to ensure a smooth, tight, surface. Next, using both hands, roll each ball into an elongated loaf shape, fatter in the middle and tapered on the ends, about 4 inches long, similar to a small football. Place each maritozzi on the prepared baking sheets, spacing them at least 1 1/2 inches apart. Cover with plastic wrap, then a kitchen towel, and let rise in a warm place until doubled in size, about 2 hours. Make the egg wash: Whisk the egg with the milk in a small bowl. Immediately before baking, brush the tops of the maritozzi with the egg wash.
Bake until deep brown, 12-15 minutes. Remove from the oven and allow to cool for 5 minutes on the baking sheet before transferring to a wire rack. Some nights after the kids go to bed (which is way too late these days – I long for the toddler years when 7:30 was the norm…) I slip into my pjs, climb into bed with a glass of wine and snuggle…. with a stack of cooking magazines. Yes, I am a cooking magazine junkie and I have a whole process to consuming them. I first flip through and mark off recipes I want to try by folding the corners of the pages down. Then I proceed not to try said recipes. The magazines are tucked away for weeks, months even years until I get the urge to browse again. Last night I came across these gems – all Italy related of course with one even dating back to 2003. It was the Rome Collector’s Edition of Gourmet - what’s a girl to do?? I had to save it. It has survived several kitchen purges and it always makes it to my “save” pile. 2. Served at a warmer temperature than ice cream, gelato melts immediately upon tasting, giving instant flavor. 3. Although there’s no hard-and-fast rule, on average gelato has about half the butterfat content of ice cream. And yes, the ice cream maker is coming out of the pantry this weekend – we will attempt stracciatella (chocolate chip) gelato and see what happens. House wine. It’s the only white or red they serve (in a juice glass, no less). And it’s perfect. As soon as you hear the angry-bee sound of a Vespa, you know you could be only one place on earth. I went to sleep inspired and had visions of biscotti dancing in my head (trying a new biscotti recipe this weekend as well – pistachio & dried cherry). Do you love cooking magazines as much as I do? What is your favorite? Leave a note in the comments below. And here is the recipe for the Roman Pizza, in case you want to try making it this weekend. 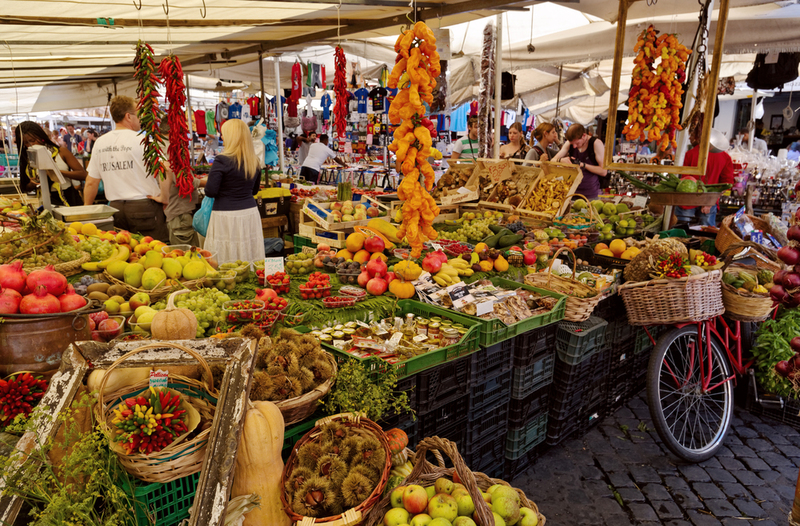 Today is dedicated to the fabulous food of Rome. Drool on. Cinnamon and ginger gelato from San Crispino - yum! Happy hour at the bar at Hotel Adriano - great cocktails! Nothing mediocre brings about debate. That is why I know Rome is a great city. Or a horrible one. It depends on who you talk to. People either love it or hate it. They either embrace the chaos, the noise, the dirt, the disfunction and call it passionate, lively, fascinating or they get dragged down by it and call it loud, dirty, disorganized. For those who love it, I adore sitting down and waxing nostalgic about every little nuance of the city. The aroma of espresso in the air, the fact that around any corner you can come across a random Roman ruin, the beauty of the small, out of the way piazze that take you completely away from city life. for those who are not convinced, I have made it one of my missions in life to convert all reluctant visitors to Rome-antics. Here are six of my favorite things in Rome that might just do the trick. This is one of the seven hills of Rome found in the southern part of the city and it has always been an oasis for me. There are no shops or restaurants on the hill - all the necessities are found at the bottom of the hill on the Via Marmorata and the Viale Aventino. Up here you will find peace: church bells from magnificent early Christian Churches, laughter from the elementary school hidden behind a wall, water splashing from a fountain located in the orange grove - a magnificent park with a panoramic view of St. Peter’s and much of Rome. If you want an education on what makes Rome so unique, you can have a crash course by visiting the one church, located about 3 blocks from the Colosseum. A 12th century church built on top of a 4th century church, built on top of a 1st century building that also includes a temple to the Persian god Mithras. You can visit all three levels and I find the whole experience fascinating. The layers of history that make up Rome are truly awe inspiring. A few blocks from the chaos and masses of tourists in Piazza Navona, you will find a tiny square dominated by an enormous fig tree. Suprisingly, very few non-Romans ever find their way to this corner of paradise. I love the outside tables at the bar del fico as well as the cozy, very casual da Francesco whose appetizer of piping hot focaccia and San Daniele prosciutto is not to be missed. Not far from the Piazza del Fico, nestled next to the church of Santa Maria della Pace, is Bramante’s Courtyard, a beautiful architectural masterpiece from the 16th century. The complex now includes a lovely cafe and in the summertime offers an evening concert series. Listening to classic music in this space is nothing short of magical. Yes, I love to shop. And while often times, shopping around the Spanish Steps is nothing but that of the window variety, I still find it enjoyable. The Italians have such style in every little thing, from fashion to paper. The storefronts are exquisite and occasionally I come across something that I can’t live without. Like a truffle slicer. We all need one of those, right? When all else fails in Rome, go to Roscioli and eat pizza bianca, hot out of the oven. They will cut off a big slice for you, wrap it in paper and send you on your way. Sit on a random Roman ruin and enjoy. Suddenly, all will be right with the world. I promise. If you have been to Rome and have a favorite place, please share it with me in the comments. I would love to hear about it! There are a ton of restaurants in Rome. Most of them are not worth a second look - frozen, reheated food, discourteous staff and outrageous prices are often the norm. But there are some notable restaurants worth frequenting: my favorites include Palatium, Armando al Pantheon and Ristorante di San Teodoro. But more often than not, a day in Rome does not involve a single sit down meal in a restaurant. Here is a typical day of eating in Rome. Be warned: this is NOT a nutritionally balanced diet in any way. It is heavy on carbs and cheese but it’s Rome and it gets walked off, right? Morning: I get up early because I love the city before it gets too busy. One morning per visit, I skip the hotel breakfast where I can eat fresh fruit and yogurt (brava Ashley, you are so healthy!) for a cappuccino and a cornetto. I don’t venture too far from the hotel - I have scoped out my favorites in all of the neighborhoods where I usually stay. My most recent cornetto experience was one with pistachios and lemon filling. It was divine. Well sugared and caffeined up, I am ready to start my day. Mid-morning: All this history is making me hungry. Time for a mid morning snack. The ONLY thing you must have at 11AM in Rome is a piece of pizza bianca from Roscioli bakery on Via dei Chiavari (near the Campo dei Fiori). They will cut you a slice as small or large as you want. It moves out of there so fast that it is usually still hot from the oven, the olive oil nestled in little indentations in the dough and sprinkled with just the right amount of salt. Lunch time: Since the lunch hour is the best time to visit some of the more popular sites such as the Vatican Museums or the Borghese Gallery, I skip the midday meal altogether (gasp) and enjoy a relatively quiet visit of my favorite places. Mid-afternoon: time for a midafternoon snack - remember, history makes you hungry! There are so many yummy options: supplì (rice balls) are one of my favorites but be careful where you get them. Some are downright nasty. Pizzarium on Via della Meloria (not far from the Vatican) is a good option but you won’t be able to resist their pizza al taglio as well. I love the pizza with thin slices of potatoes (I told you that carbs would be involved). Early evening is my favorite part of the day in Rome. The light is perfect, the pace slows down significantly and there is no better time for people watching. I make my way to one of Rome’s bustling wine bars (Il Goccetto near the Piazza Navona is a favorite) for a glass of wine and a plate of cheese and salami. Dinner is served and there is nothing better. One last stroll before I head back to the hotel - a stop for the requisite gelato or for my new favorite indulgence, discovered on my trip to Rome last October: the millefoglie bar at Pasticceria De Bellis. You choose the toppings and fillings and your creation is made to order right in front of you. Seriously, with all of these delights, who has room for “dinner”?!? When I am feeling the need for inspiration and a return to beauty and style, my thoughts turn to Rome. I had the good fortune of spending last weekend there for a very special event that I will talk about later this week but right now I have Sunday on my mind. Sunday was spent the way it is supposed to be - with lots of love, laughs and good food and wine. It was an escape from the grind of everyday life. As the Eternal City slowly woke up, I wandered to a cafe near my hotel and allowed myself the decadence of a cornetto with my morning cappuccino. This one was filled with lemon and pistachios, an incredible combination. If I could figure out how to import the pastries from Rome to the US, I would open a bakery and spread the good word of the art of the Italian breakfast. Making my way into the center on a beautiful sunny morning, I was content to take in the unique nature of the city, new and old, ornate and simple, juxtaposed next to one another in architecture, storefronts, restaurants. This is the true beauty of Rome. A perfect example of this is the Piazza Augustus which includes in one square examples of Fascist, baroque, imperial and modern architecture. The relatively new structure that houses the Ara Pacis was designed by Richard Meier (who also designed the Getty center in LA) and was not without heated debate about its place in Rome but I really like it. Before I knew it I was whisked away by Jenny and we headed for the hills - literally. We made our way to the tiny hamlet of Montecelio, northeast of Rome, where we feasted on bruschetta, prosciutto and cheese, fabulous steaks cooked over an open fireplace and a couple (or a few, but who's counting) bottles of Brunello. A passeggiata through the village completed the afternoon as the October sun shone down on us and Jenny and I caught up on years of our lives. To me, Sunday embodied everything that I love about the Italian culture and I returned to the US feeling truly fulfilled and blessed.